The headline Infosys acquiring AxonGlobal came as a surprise to when I read the news on Timesonline. Indian companies are cash rich and they are taking over other companies in the world to improve the line of business and service offerings. "Mr Gopalakrishnan of Infosys insisted that there was still strong demand for SAP systems, with Infosys registering a 62 per cent increase in orders in the past year. He added that the deal would allow Infosys to compete more effectively on the international stage with rivals such as Accenture, Oracle and Cap Gemini. Around half of Axon’s revenue comes from the United States. “Our rationale was that with this acquisition, our global reach, scale and our ability to participate in large transformational deals would be significantly enhanced,” he said. " This is a good example of Porter's Five Forces Model for assessing Assessing the Balance of Power in a Business Situation. Buying one of the competitors means "Eliminating a threat ". This will further the business objective in an intense competitive environment. Axon was set up by Mr Hunter in 1994 after he left his job with SAP to create a team of IT specialists. The company floated in 1999 and today generates more than £200 million a year from its base in Egham, Surrey. Its customer base includes Kraft Foods, BP and Microsoft, as well as public sector clients such as Transport for London and Wolverhampton City Council. Now Mr. Hunter and his team will be richer by £ 407 million for the enterprising decision they took way back in 1994. Axon Global business is primarily SAP and the consultants (employees) would have enjoyed a growth in salaries with the growth in market. Management takes decisions quickly since they are focussed in one line of business. Moreover the profitability were not much of concern since the projects were either less profitable or more profitable. 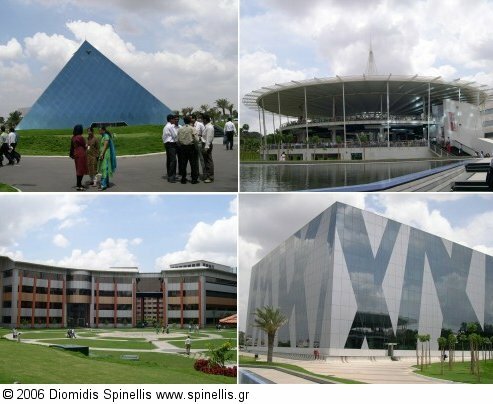 Infosys is a large organisation with many lines of business. So policy decision will be made taking into all the line of business into account. The name Axon may disappear from the market place with SAP offerings will be one of the line of business. I am not sure whether Axon employees will be benefited by the takeover since Infosys is quite conservative in salaries and but focusses more on benefits. Infosys has a socialist culture. So it would be interesting to watch how Infosys retains the Axon employees who were accustomed to get good salary rises every year. Congratulation Mr. Hunter on the deal. You should have good holidays in Bahamas.